SALT LAKE CITY — Utah football head coach Kyle Whittingham addressed the media Monday as the Utes head into a bye week following their second straight road defeat. Among the topics Whittingham addressed were Utah's struggles with turnovers and the team's quarterback play against USC, a game the Utes lost 19-3 to the Trojans. 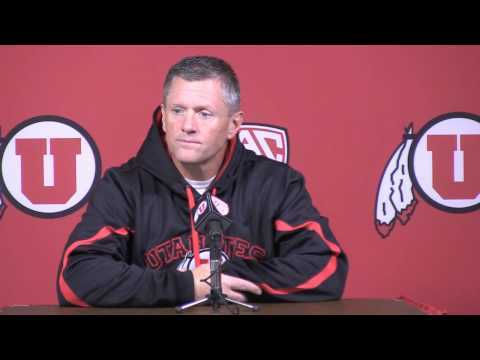 The entire text of Whittingham's Monday press conference can be found here. Kyle Whittingham: Okay, once again, turnovers led to our demise. It was unfortunate; we played exceptionally well on defense. Special teams was excellent as well. We definitely won the special teams battle. We couldn't get much generated on offense, but there's going to be games that are defensive struggles. There's going to be games that are offensive shootouts. The one common denominator in those games, and in every game, is turnover margin. That's the thing that usually is the difference-maker. And in this game, it was exactly that, where four turnovers and no takeaways and you're probably going to win zero games a season doing that. It's something that's got to be corrected. In our losses, it's showed up. In our wins, it's been reversed. It's pretty apparent what our issue is. We've got to get it fixed. That's the long and short of that. We've got a week off, as far as no game this week. We'll practice, we'll work Monday through Thursday, give them a three-day weekend, then come back Monday of next week to get ready for the Sun Devils who are coming to our place. Excellent team, by the way, very good football team. First place in the (Pac-12) South and a great offense, second only to Oregon in total offense and scoring and playing really good defense, too. Very complete football team is what Arizona State is. Reporter: Coach, would you say that all five of your offensive line's starter's positions are safe at this point? KW: Well, we feel they give us the best chance to win. They're the guys that have been playing together since last spring. Isaac Asiata is a guy who does a great job and maybe merits an opportunity to play some snaps in a game, but other than that it's those five guys are clearly the best five that we have at this point in time. Reporter: Coach, can you kind of take us through the quarterback decision? I'm sure a lot of tough thought went into that with injury, with backup, with Conner Manning, I'm sure, warming up. Kind of take us through the quarterback flow going into the game and then during the game, how things kind of went down. KW: Going into the game, we hoped that Travis (Wilson) was going to be able to be effective. It turned out not to be the case. We struggled, brought (Adam) Schulz in to try to get a spark and get something going. (We) brought him in and didn't really have a whole lot of success there, either. Conner Manning was never really a serious consideration to put him in; he's got the redshirt label on him right now and really is, he's a true freshman. He's probably not quite ready for a situation like that. That's where we're at. We've got to get better play at the quarterback, we'll be the first ones to tell you we've got to get more effective play there. That's something going forward that's got to improve. Now, Travis was lights-out the first five games; we had very good quarterback play and it's just been the last couple games that we've had struggles. Reporter: How much of those struggles do you think were a result of that hand, the interceptions? KW: You know, if you’re out there, you’re good, and so we're never gonna say that you shouldn’t be out there if you can’t perform, and so we’re not going to ever use that as an excuse. One thing for certain is that the offensive line needs to play better, you know. We didn’t protect very well, we didn’t run-block very well, we didn’t take any stress off the quarterback with an effective run game, so it’s not just the quarterback. There’s a lot of things involved; we didn't catch the ball particularly well when we did have opportunities to catch it at wideout. It was a collective effort and not a very good one overall. Reporter: Kyle, did you watch the film compared to how you felt right after the game? Was it as bad as things were or did you see some positives or, reviewing the film, how did you see the game? KW: Oh, there was a lot of positives on the defensive side of the ball. We played our best defensive game of the year by far. We stuffed the run, gave up a few things in the throw game. You’re never going to completely shut down a quality Pac-12 team like USC, all across the board on defense. But if we can get that defensive effort then — you know, 250 yards, 30 yards rushing and 14 first downs, not very productive on third down — so that was just a big positive. The kicking game, as I mentioned, was a big positive. We out-netted them, I think, 12 or 13 yards every time we punted. We gained in field position four or five yards better than them in the kickoff, kickoff return game. We did miss a field goal, that was disappointing. They were, what, 4-for-5 on their field goals, we were 1-for-2. So there was positives there, not a lot of positives on offense, hard to find a positive there other than we played hard. The players were playing hard and they’re giving great effort, just not getting great results the last couple weeks. KW: Yep, it has, a year and a half. Reporter: How do you approach that now? KW: Just got to keep working on it. We work on it every day in practice, we have turnover circuits and things that we do and emphasize in practice on a daily basis. Plus, we’ve missed out on a bunch of opportunities this year. It's not like we haven’t had several opportunities to intercept the football. The ball's been on the ground several times; now we’ve had the opportunity to recover several fumbles, but we have the opportunity to recover more that what we’ve gotten. So, we just got to keep working and keep preaching it. The turnover margin is just that, it’s the turnover margin. It’s not all just the offense turning the ball over, it’s combined with the defense not taking it away, because if we take it away four times like they do, then it’s even. So, that turnover margin is a team effort, not just an offensive thing. Reporter: How much time does your staff spend discussing whether or not to play Conner Manning? KW: Very little, and we’re to the point now where we don’t think that’s a viable option in his best interest or ours in the long haul. And it’s a win-right-now mentality. You’ve got to worry about the moment, but in fairness to Conner and in thinking objectively, what that would bring to the table for us right now and in our situation, we don’t think that that’s a smart move at this point in time. Reporter: Coach, is there anything that you can do to maybe cut down on some of the turnovers in the passing game? Offensively, are you looking at maybe going a little bit more conservative? KW: No, not more conservative for certain. We’ve got to continue to try and move the ball; you know, a bunch of the interceptions have been off deflected passes where it's been right in our hands. The one on the tumble screen Saturday should have made a completion and a gain instead of a huge swing in momentum with the turnover. So it's been that and a couple poor decisions and I’m not here to say that there hasn't been some poor throws and poor decisions, because there has been. But a great portion of those interceptions have been — I don't want to say flukes, but (they were) things that should not have happened. Reporter: Is there anything you can look at or point to over the last couple of weeks as far as the inconsistency in your offensive line play from Stanford to the last two weeks where they haven't been as good as they obviously were against Stanford? KW: No, no one thing, just collectively, we haven’t been as good. You know, I think one thing at Stanford, you know, we lost our two tight ends the week before and we came out and we had some things that they hadn’t seen. (It) took them by surprise, didn’t adjust or didn’t have the opportunity to make the adjustments in-game, and since that point in time, you know the element of surprise, obviously, has been gone there. And so, we’ve got to just figure out ways to utilize our personnel and maximize the guys that we have available because we spent all spring and fall adhering everything to a one and two tight-end attack which was working pretty good until the obvious happened. Reporter: Coach, you talk about how ASU has a very complete football team. What do you see as your biggest strengths that match up really well against ASU? KW: Defensive line. I think our defensive line matches up with anyone in the conference, and that’s been proven so far every week out. Let’s see, our linebackers I think are playing really well. I think Jacoby Hale had a big impact on the game, Trevor Reilly — who’s a slash guy: he’s a part-time linebacker, part-time defensive lineman — I think that’s a good match for us. Our running backs have been productive when they’ve had opportunities. We didn't have much opportunity to get them underway on Saturday. And the kicking game, I think that our kicking game matches up week in and week out with anybody. Reporter: And coach, how big of a difference do you think just mentality wise playing at home makes for this squad? KW: Well, it’s been a big difference so far. Our home mentality has been really good and we’ve been very competitive at home; haven’t won them all, obviously. We’ve done a pretty good job at home, not no good a job on the road in conference play. Reporter: Wanted to get your thoughts on Trevor Reilly being one of 12 (finalists) for the Butkus Award. KW: Yeah, very well deserved and he had a big game on Saturday — two or three sacks, two or three tackles for loss. And he’s continuing to make an impact for us on a weekly basis and to be one of 12 guys narrowed down at this point in time on that list still remaining is an honor for him, well-deserved like I said. Reporter: Kyle, there’s only about four or five Pac-12 teams that have more players currently in the NFL than your program. Is that deceiving in any way? Should that suggest that Utah has as good a players as anybody? KW: I think our top-tier players are very good. I think you look at, when you look at one through 85, that’s really what you’ve got to go on to determine how talented your roster is. And so, I think our top-level guys through the years have been as good as most other people’s top-level guys. It’s really the core — you know, your one through 10 and then you throw out your bottom 10 — it’s really the core in between that really is the difference-maker. Reporter: Kyle, do the lack of interceptions have anything to do with the lack of experience you have in the secondary this year? KW: I think so. I think we’re breaking in three new secondary guys, well four new secondary guys when you count the nickel package when we have five DBs on the field. I’ve been pretty pleased and proud of the way that secondary’s come together with, you know, with eight games, and we still have four to go, so it’s not a complete season. But so far, the body of work has been pretty competitive; we made some plays on the ball Saturday and have come along with a step forward each week, you know, throughout the season. As soon as I say that (I) put the jinx on them. But to say where we started with those guys, experience-wise, and just their amount of time in Division I football for a lot of them, it’s been a pleasant surprise for us. Not a surprise, but a positive for us. Reporter: Do you guys keep track of a stat like interceptions dropped or possible interceptions or anything like that? KW: Yeah, missed opportunities we call them, and there’s been a bunch of those this year, missed opportunities. Reporter: Is it double digits? KW: Probably nearing double digits or just into double digits as far as that goes. For turnovers, are you talking about takeaways? Yeah. There was other missed opportunities like sacks and that type of thing, but just for takeaways, yeah. Reporter: Where is this team with the offense? With a matter of four games to go, do you think you have the elements in place to be successful? Is it a matter of just tweaking things or what is it? Are you taking a harder look at maybe making some some changes in philosophies? KW: Well, we don’t want any wholesale changes; we’ve got to decide what our best opportunity is. Do we slow the game down, to shorten the game, ala Stanford? That's their mentality to shorten the game, win with defense, though their offense is being very productive. So there’s a lot of different ways you can go. The one thing we’re not going to do is to wholesale change; it’s too late in the season for that. So we’ve got to decide on the things we’ve done well, try to emphasize those and maybe streamline things even a little bit more than we have in the last couple of weeks. Reporter: Can you talk about your success following a bye week? Is there anything that you do differently than the rest of the season? KW: You know, I think we’ve handled the bye week pretty much the same each year and I think, you know, when talking to the other coaches, it's pretty similar. I don’t think there’s a whole lot of variance with teams during the bye week. They get some work on the field, give their players some down time to get rested up, and so, I don’t think that there’s anything we do unique or different than anybody else. We have had a pretty good track record, but again, the biggest deal coming out of a bye week is who you play coming out of the bye week. That determines the game more than anything, not necessarily the bye week itself. Reporter: With this week and then next week, especially with the quarterback position, is it more about physical, getting healed and healthy, or is it more about the confidence and the mental side of things? KW: I’d say both, I’d say both. We’ve got to make sure that we’re confident and mentally in the right frame of mind. And we’ve also got to improve physically, and so I’d say it’s a 50-50 mix on that front. Reporter: The contrast between success in the Mountain West and now, the frustration of losing so much in Pac-12 play, talk about the fan base — maybe the expectation of being too high, is it coming back down to reality? KW: Well, the competition level in this conference is second only, and maybe a very close second to the SEC in my opinion. And so it’s a very competitive league. There’s no doubt that we have gotten better as a football team from when we first entered the league until now, but the problem is, you know, that as far as the conference itself has gotten probably better at a faster rate than we have in the last three years. And we’ve got to pick up the pace and continue to improve; it’s through recruiting is how it’s going to happen. But you know, our fan base has been great, they’re out there to support us. They have high expectations, which is great. You know, you don't want a fan base that doesn’t want to win. And so we’re happy with the support we’ve gotten, and they’ve been in that stadium every single week, and we really feed off those guys and so it’s been a big positive for us. Reporter: Kyle, could you just talk about having Eric Weddle back? It looked like he had a good time. Reporter: Yeah, he’s eligible this week. He said he had a good time hanging out with the team on Saturday. KW: He always does. Eric is a great alum of our football team, has been a great ambassador for our team. I’ve said very often over the years, and (he's) just a big support to our guys. He talked to the team day of the game, and at the pregame meal, or right after the pregame meal ... all our players respect and admire him for what he has done, what he’s accomplished. And like I said, he has just been a great representative of our program while he was here, and ever since he’s left. Reporter: Any changes in philosophy on the run game, or are you still looking at the three guys? KW: Probably under-utilized Kelvin (York) a little bit on Saturday and he’s going to get more carries. So the one thing that will happen is that Kelvin will get more than what he's been getting the last couple of weeks. He’s earned that; he’s ran physically, and in hindsight, we should have used hime more on Saturday. Reporter: I don’t know if you’ve noticed along the lines of moving up in conferences, TCU is kind of having the same struggles. Does that surprise you? KW: No, it doesn’t, because when you go from non-BCS to BCS, there’s a catch-up phase, and really, that's the question you asked earlier. The core of your team has got to continue to improve, and I think TCU is very similar as far as their top tier of players (being) excellent. ... What are they, 3-5? And they’re struggling in the Big 12 right now, but Gary Patterson will get that right eventually. He's a heck of a coach, and they're just going through some of the same growing pains that we are. In my estimation, you have to ask him for specifics. Reporter: How much of a difference is it making having your two star tights end, or the tight ends you'd gone through camp with, not having them on the field and what of things do you do in compensation for that or can you do moving forward? KW: Well, it’s been a huge departure from what, like I said, we planned all spring and fall around those guys in a lot of ways, in the utilization of their skills. And Jake Murphy was having a very good year prior to going down and Westlee (Tonga) hadn’t done as much as we wished he would have, but (it's) not his fault. We just needed to get him more involved. And so we had a complete change in personnel groupings when we lost those guys, but that’s the nature of the deal. I mean everybody in the country’s down a certain amount of guys, and you've got to adjust and respond and be able to move forward. But it was certainly something that impacted us.